The weekend went great thanks to many of our club members who volunteered their time as well as the family members that got roped into helping. In addition we had some amazing help from the Sandgate Scouts. As organiser of the show I cannot thank all of you enough. Without you volunteering your time, muscle and cooking skills the show would not anywhere near as successful. We had 64 traders (in the hall and outside) and an estimated 2,000 visitors. Our club stall was busy with the fossicking area. The jewellery making demonstrations went well and were greatly appreciated. We might look at it again next year. Both days we drew the Lucky Door Prizes that were all picked up by the happy winners. 2. Prize (Amethyst Amulet): Samara S.
3. Prize: (Jade & Silver Bracelet): Pat D.
The weather gods were with us and the rain held off until Sunday afternoon. The storm clouds threatened everyone enough that we managed to get home in reasonable time. 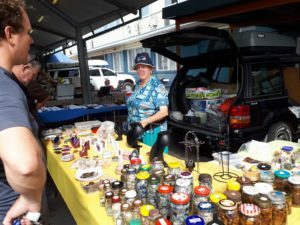 Despite the sun and heat we managed to sell nearly 50kg of sausages and the addition of a barista style coffee cart was a big hit among the visitors, dealers and volunteers. Thankfully there was only a minor medical incident that was seen to by our First Aid Officers. All in all we had a great show and despite the hard work that went in lots of fun and time for laughter and a sausage. 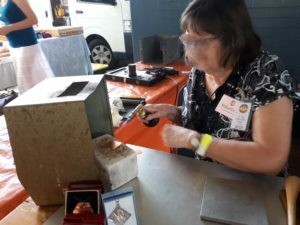 So again, a big thank you to all volunteers, traders and visitors and we are looking forward to welcome you at the North Brisbane Lapidary Gem Show in 2019.